CHI's final report for 2018 insurance prices is now available. It’s likely that the increases are driven by a mix of higher health care costs — especially for drugs — and uncertainty from Congress about federal health policy. Every Colorado county will have at least one insurance carrier on the individual market, thanks to Anthem’s decision to stay in the state. The picture could change dramatically by this fall depending on the fate of the Senate’s health bill — prices could come down, or conversely, carriers could abandon the market. Colorado insurance companies on Friday requested large price increases on the individual market for the second year in a row — an average of 27 percent across the state. The prices would apply to 2018 insurance policies. Increases by carriers range from a low of 12.1 percent for Rocky Mountain Health Plans to 41.2 percent for Cigna. The number of carriers and plans offered should remain fairly stable after several carriers left the state the past two years. The requests come as the U.S. Congress is debating a repeal of the Affordable Care Act (ACA) that would have major consequences for the individual insurance market. The rates will not be final until the state Division of Insurance (DOI) approves them later this fall. If the requests hold up, they will be the highest price increases Colorado has seen on the individual market since the ACA took effect in 2014. The news is especially disheartening because until the congressional debate began this winter, signs had pointed to an individual market that was stabilizing after years of turmoil. 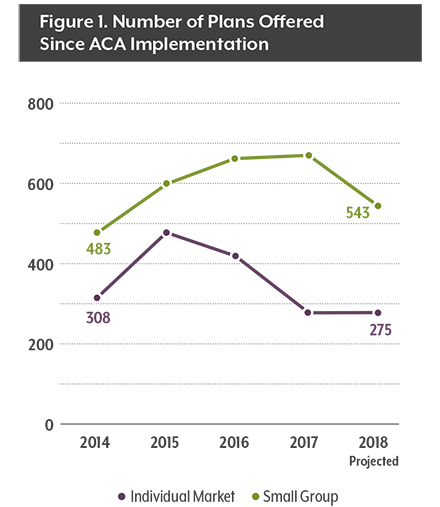 Insurance companies have struggled to adapt to the ACA’s changes to the individual market. In 2014 and 2015, they tended to offer low-priced plans to capture market share. But customers were sicker — and costs were higher — than many carriers expected, which led to dramatic price increases in 2016 and 2017, especially in rural Colorado. All insurance companies in Colorado lost money on the individual market in 2015, according to the DOI’s latest Health Costs Report. There was evidence that carriers had finally adjusted their prices to their costs after 2017’s price hikes, both in Colorado and nationally. The Kaiser Family Foundation found that carriers’ medical loss ratios — their spending on health costs compared with the premiums their customers pay — fell to 75 percent in the first quarter of 2017, the lowest it has been since the ACA took effect. 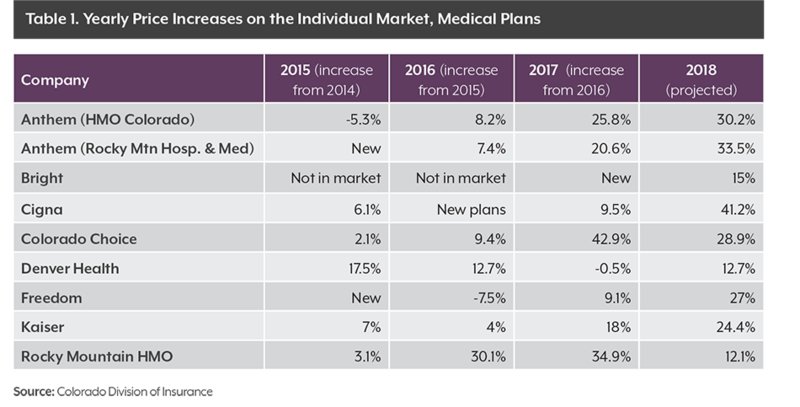 Nationally, insurers have blamed their price increases on the uncertain future of cost-sharing reductions (CSRs), a feature of the ACA that gives reduced deductibles and co-payments to people who make less than 2½ times the federal poverty level and buy a silver plan. CSRs are paid directly to insurance companies on their customers’ behalf. The controversy has spooked insurers, and some companies have cited it as the cause of the large increases in their rate requests for 2018. The Kaiser Family Foundation has estimated that insurers would have to raise premiums for their silver plans by 19 percent to offset the loss of CSR funding. If Kaiser’s estimate is accurate, it would explain part of Colorado’s proposed rate increases for 2018. Insurance prices for small employers are also rising, even though they have been much more stable since 2014. Average requested prices jumped 7.5 percent for 2018 after going up just 2.1 percent for 2017 policies. 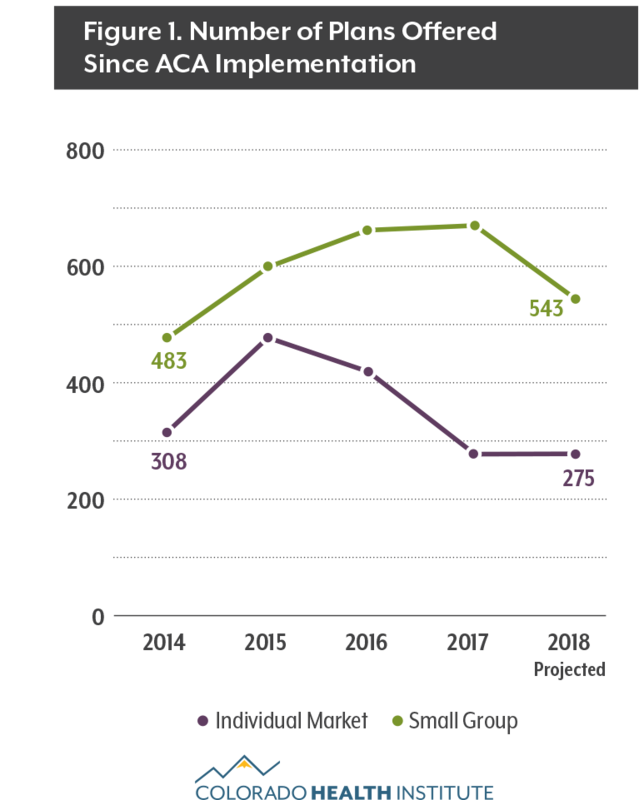 Choices on the small group market will shrink, with carriers planning to offer 543 separate plans. That’s down from 667 this year, and it is the first time since the ACA took effect that choice on Colorado’s small group market will contract. The Colorado filings closely track what is happening in other states. Insurers have raised their premiums by double digit percentages across the country for 2018 plans. In Oregon, most individual requested rate changes fell between 12 percent and 20 percent. Anthem Health Plans requested an average increase of 33.8 percent in Connecticut and 34.1 percent in Kentucky. Officials from Washington State reported an average increase of 22.3 percent for 2018 rates. And Tennessee’s BlueCross BlueShield requested an increase of 21.4 percent, while Cigna is seeking a 42.1 percent increase in the Volunteer State. In Tennessee, the spokeswoman for BlueCross said the company would have been able to offer only a nominal increase for 2018, but uncertainties at the federal level led them to propose another double-digit increase. This concern has been echoed by insurers and states across the country, including Colorado. The numbers across the country are clear: From Washington State to Kentucky, to the East Coast, rates are going up. Insurance carriers have exited the individual market in several states, including Tennessee, Ohio, Iowa, Washington, and Missouri. An average 27 percent rate increase will make insurance unaffordable for many Coloradans, especially coming on the heels of this year’s 20 percent average increase. And people in some regions of the state are likely to see even steeper increases. The DOI is currently studying a reinsurance system for Colorado’s individual market as a result of Senate Bill 300, which called for the DOI to study using high-risk pools or reinsurance programs to lower insurance costs in Colorado’s individual market. A report is due to the legislature early this fall. Other states, including Alaska and Maine, have had success in bringing down prices through such programs. But this year more than ever, it may be a wise move to wait and see what happens when the rates are finalized in the fall. The coming weeks may bring more clarity from Congress over the direction of federal health policy. If the CSRs are funded and Congress either settles on a replacement for the ACA or leaves the law intact, then insurance companies will have a more stable environment in which to price their products. But if the debate remains open, then we expect insurance companies to keep their prices high enough to compensate for the uncertainty and risk. Most Coloradans are not affected by the proposed rate increases because they get their insurance from a large employer or a government program, such as Medicare or Medicaid. The July 14 rate requests affect only policies that the state regulates — those sold on the small group market and individual market. 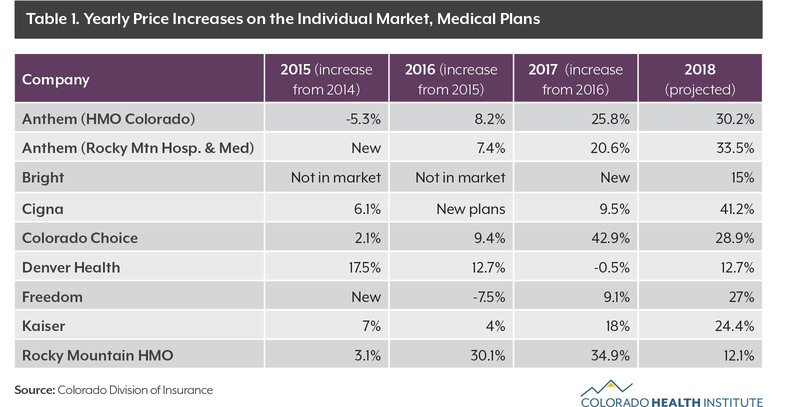 The highest price increases since 2014 have been on the individual market, where people buy their coverage directly from an insurance company or through the state’s online marketplace, Connect for Health Colorado. Roughly eight percent of Coloradans are covered through the individual market, although it is used more commonly in some rural Western Slope counties. Research Analyst Adrian Nava contributed to this report.